While the world’s most popular mobile operating system is quite powerful, porting it to PCs doesn’t sound like a great idea right away. But Jide, a new Chinese company, took a chance. After two successful Kickstarter campaigns — one for a “laptop experience on a big Android tablet” and an Android mini PC, that was even more successful — Jide is selling devices running Remix OS and it just released a first developer alpha version of its software, which you can download for free. Reviewing a very early alpha version doesn’t really sound fair, so it’s more something like a first impression. 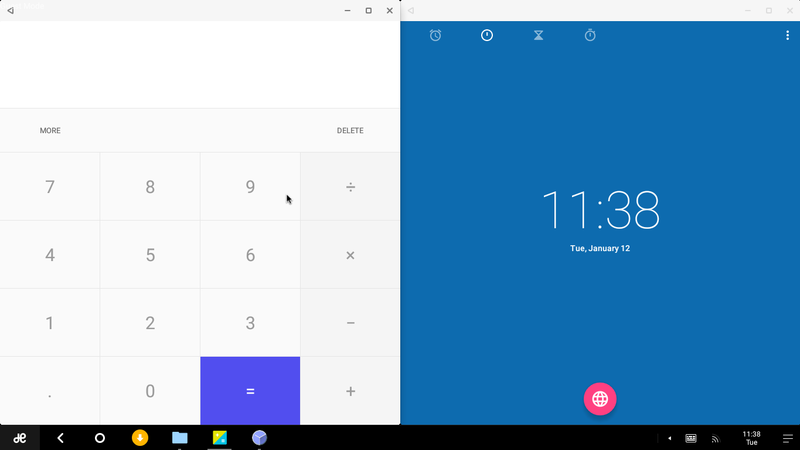 Jide didn’t just make stock Android running on PCs, Remix OS is based on the open source Android-x86 project, which, for now, is Android 5.1. It runs on a USB flash drive (2.0, but 3.0 is preferable because of speed), but you need some knowhow of what a BIOS is in order to run it, although it’s really not that hard. Once you’re in, you see a desktop environment that you recognize from other PC systems. The first version I tried came with the Google Play Store, but newer versions do not have that included yet. However, you can install any APK and there is a one-click way to get the Play Store. Besides the expected desktop there is a taskbar and a Windows like start button and menu, comparable to the app drawer on your phone. There is a notification area on the right side as well as status things like wifi and a clock. It also comes with a real file manager. While Android has multitasking built in, it’s not really multitasking. 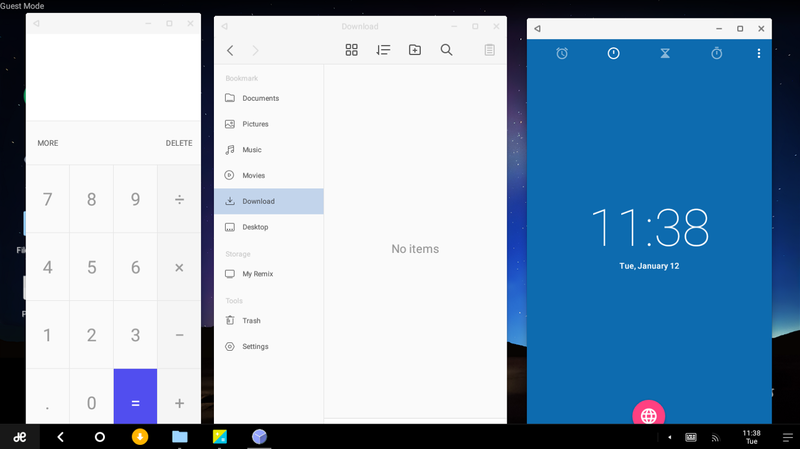 But in Remix OS you can open multiple apps at the same time and resize the windows to position them. An app auto-snaps to the side when you drag it towards it. It all works really intuitive. Having Wikipedia and a document open at the same time opens up new possibilities, not found in regular Android. The OS itself is actually quite minimal, but has a consistent and nice design, from the file manager to the settings menu. It feels very user-friendly, especially with the Play Store installed. I was surprised how well it worked with my hardware, considering that it wasn’t specifically optimized for my laptop. It immediately found wifi networks — something I can’t say of all Linux based operating systems — the mouse and trackpad work well, although scrolling with the mouse isn’t perfect, so I prefer using the trackpad, which even recognizes multi-touch. Right-click on the mouse works and even well-known keyboard shortcuts like alt+f4 and ctrl+f are supported. But, like I said in the beginning, it’s an early alpha version, so of course there are going to be bugs. Coming out of sleep mode made the screen flash and sometimes that meant that I had to restart the system. Also, for some reason, it altered the clock in Windows. But most of the bugs I encountered are probably easy to fix before a stable release is out. But why would you want Android on your PC? Good question. I think it really depends on how much of an upgrade you want your PC to be over your phone and tablet. Yes, Chrome is faster than on your phone and yes, you have better multitasking, but it’s still just the mobile version of Chrome. That means that there are no extensions. Of course there are Photoshop apps on Android, but it’s not exactly anything like Photoshop on Windows and OS X. If you can do everything you need to do in apps, this might be for you. But consider that not all apps are optimized for 11 to 17 inch screens. Some are still just stretched mobile versions (I’m looking at you, Twitter). 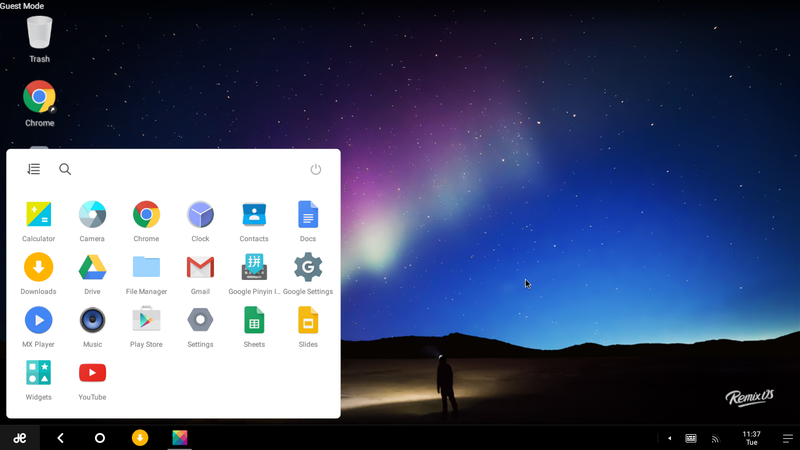 There are (denied) rumors that Google might be merging its Chrome OS and Android, but Remix OS does not convince me that Google should completely ditch Chrome OS. Mainly because of the full desktop browser. 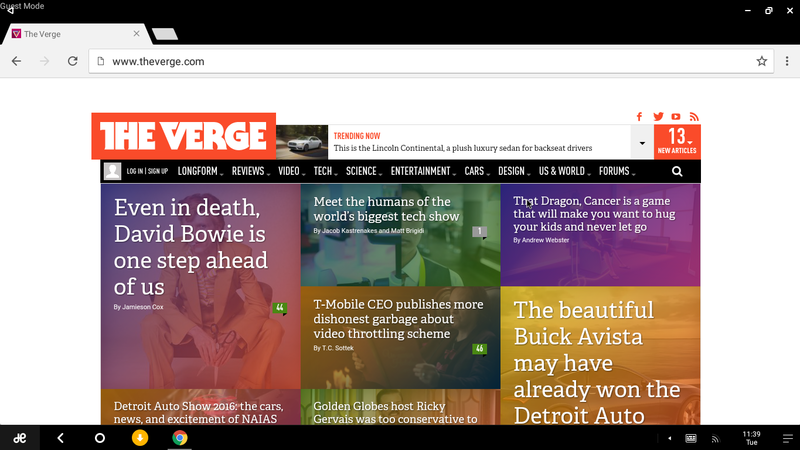 Android apps can run on Chrome OS and for now, I think, for Google, that’s the best way to do it. It’s still a bit too early to judge, but so far I’m really impressed with how well this alpha runs. Will I be using it on a daily basis? Well, I will probably use it every day just to try out new things and because I find it useful to have some apps on my laptop. I like easy-to-use OSes, but because of the things I need to do on my laptop, it’s not a full replacement for me.